Sight: What are they watching? There will be 78 million millennial digital video viewers, representing more than 92% of all U.S. millennial Internet users, according to eMarketer. The above is coupled with the fact that of millennials who are consuming traditional TV, 65% are using a second, third, or more screens to consume content simultaneously, according to Verizon. With multiple screens vying for their attention, millennials are texting while watching TV, or watching digital video as they video chat with friends, or engaging with more screens than just that. How about that AMC Theaters allowing texting during movies scare? Oh, for goodness sake. With that, we know the connection to content is constant. In today’s influential world, Millennials are more likely to listen to and be influenced by their favorite YouTube superstars compared to professional athletes. According to VideoInk in 2015, millennials watch 11.3 hours of free online video per week and 8.3 hours of TV per week on average. In the YouTube vs. TV battle, marketers should be mindful that millennials hail YouTube as the ultimate winner. Hearing: What are they listening to? In terms of music, Millennials are discovering and enjoying music differently than the generations before them. Younger listeners spend on average 25 hours a week streaming music from a variety of online services, according to Vevo’s new “Music Fan Report”. Brands need to be sure they’re mixing things up where these Millennials ears are ringing. Touch: What methods are they using to communicate? A millennial’s communication originates in their hands. Everything starts on their mobile phones, including snaps, Facebook posts, Instagram tags, and Tweets. 89% of adults ages 18-29 use some form of social media, according to the Pew Research Center. Millennials are finding new ways to engage with their friends, family, and their communities every day. That means that brands and other organizations must do the same to stay relevant and in front of their target audiences. Snapchat is a great example of a company leading the way, instead of following trends and adapting. Taste: How do millennials prefer their content? Smell: What products are they ultimately choosing, and why? Millennials may not be relying only on their noses to remember their favorite products, they can sniff out when they’re being marketed to. According to Animoto, two out of three say that they will stop watching a video if they feel the tone is too promotional. Brand loyalty is influenced heavily by whether they think they can trust a brand and by what others highly recommend to them, from the shoes on their feet to the snacks they eat and the apparel they wear. Fifty percent of millennials say that being real, genuine and authentic are the most important factors with regards to distinguishing favorite brands, products or services. Keller Fay Group has enormous amounts of data on this group. To sum up, Millennials are consuming original content that has an authentic voice, connects to them personally and provides a message that they relate to and possible share. In order to succeed, brands need to be active & multi-sensory in the space that millennials are interacting otherwise they just won’t reach this demographic holistically. Snapchat may not yet have the following of the other more established players in the social space, yet its growth continues as it becomes more influential through its capacity to introduce new innovations that keep the app ahead of the game. Every week there seems to be new features to try out. Snapchat first made waves with content that would disappear after 10 seconds or less. But where many other apps have hung their hat on their initial premise, and have been unable to hold that initial attention as a result, Snapchat’s gone on to introduce additional, industry-leading functions to keep their primarily young audience base coming back for more – and tapping into an arena where brands need to play. A bit of history: They introduced Stories in late 2013, geofilters in mid 2014 and the lenses in September 2015. Just last month, Snapchat announced a major revamp of their messaging features. In my opinion, their ability to remain loyal and responsive to their audience needs and interests, and continuously deliver on new features to them, is what keeps the app top of mind, and keeps their users glued to their devices. Snapchat’s 100 million daily active users are now contributing more than eight billion video views on the platform every day. Per day. And now… the introduction of new emoji stickers for videos. The stickers are like any other emoji, but they move and scale in proportion to the actual video. It’s odd looking – but then again, this is the platform that popularized “rainbow vomit.” Am I right? Video stickers are interesting and interactive – and you can immediately see how this new feature will be popular among Snapchat’s fan base. Oh, you kids! According to TechCrunch, Eitan Pilipski, an engineer who Snapchat recently recruited from augmented reality company Vuforia assisted in its development. Vuforia is a shop that strives to help brands generate vision-based data and computing, including mapping 3-D objects into real-world video – for example, enabling gamers to overlay 3-D objects into a physical space via their tablet device. If Snapchat’s other innovations are anything to go by, I’d expect to see other platforms looking to implement similar in the near future, especially if the option continues to be popular among Snapchat’s user base. And, this all coming on the heels of this week’s f8 Conference with the use of bots, AR, VR, and AI, of course. So, why have I started using Snapchat? Understanding the way people communicate, share news, endorse brands, products and services, and stay engaged is a passion of mine. And Snapchat’s ability to stay on trend and avoid becoming another teen fad that dies out truly does keep my interest. Testing, using, adopting and understanding the latest technology and features is the best way to understand how people will use it, behave around it, and in the end – think of it. The regularity with which Snapchat has been able to execute new innovations and keep users coming back bodes well for its future. They are never just trying to play catch up. They create its own trends and lead the way, showing how in touch they are with their core users. Again, it’s not as big as the established players, for sure, but it’s getting there. I suggest you stop ignoring it and pay a visit to ‘Michael Platco’ and his friends to join the party. A list of more Snapchat folks that are killing it can be found via Inc.com here. And for brands that are killing it, check out this rundown. The way we use social media to share and interact is fundamentally changing with the rise of messaging apps and bots. Soon we’ll notice most social activity is no longer going to happen in public, instead transitioning to private groups and messaging apps. There will be a significant change in what “social media” is. This is a change that will challenge everything we’ve learned about social media over the past 8-10 years. Until now, standing out in the timelines and News Feeds have been the main goal of most strategies. Soon these channels are no longer the first place people will turn for discovery and interaction. As one-to-one messaging begins to dominate the social media world, it creates an array of new insights, questions, challenges, and opportunities for marketers. Since then, Facebook have made huge strides in the messaging space, acquiring WhatsApp for $19bn and building Messenger up to 900 million users worldwide. A quarter of all downloaded apps are abandoned after a single use. Only instant messaging bucks the trend. Over 2.5 billion people have at least one messaging app installed. Within a couple of years, that will reach 3.6 billion, about half of humanity. The market’s leading duo, Facebook Messenger and WhatsApp, which is also owned by Facebook, are nearing one billion monthly users each. Many teenagers now spend more time on smartphones sending instant messages than perusing social networks. WhatsApp users average nearly 200 minutes each week using the service. When it comes to sharing, private messaging is already leading the game. “According to a RadiumOne study, almost 70% of all online referrals come from dark social globally. For the UK, this figure increases to 75%.” –Via Econsultancy. The transition from public social media to chat apps could be the biggest change in internet culture and marketing since social media itself. However, how will brands maximize the opportunities presented by messaging apps? One brand that has started to experiment with dark social, and marketing through messaging apps is Adidas, who are using WhatsApp to build hyper-local communities in cities across the world and have previously used Twitter’s DM feature to invite a group of advocates to a private conversation with one of its sponsored players. Right now, it’s a time for testing and learning to figure out what works and how open customers are to interacting with brands one-to-one setting. Here come the bots – with the biggest apps, where users are spending the majority of their time, becoming platforms to which other apps integrate to. Essentially bots are a way to simulate conversations human users. You can interact with bots for entertainment or to get things done. For example, instead of phoning for a taxi, you can now order an Uber using a Messenger bot. Unlike apps, bots don’t need to be downloaded, they live on servers, not a user’s device. This means using bots should provide a smoother experience for the user as switching between bots doesn’t involve tapping on another app. The trend of apps and bots living within larger platforms has already taken off in China, where a large number of brands run bots through WeChat. And yesterday at F8, Facebook announced more about their Messenger bot store, following hot on the heels of Kik, who announced a bot store of their own last week. According to Wired, bots within WeChat enable its 600m monthly users to book taxis, check in for flights, play games, buy cinema tickets, manage banking, reserve doctors’ appointments, and even apply for mortgages, without leaving the app. What does this all mean for marketers? Organic engagement on many social channels is in decline, but at its heart, social media has always been about connecting with people one-to-one. That won’t change. What will change is the strategies and platforms we use to connect. As customers transition to private messaging, it’s essential for marketers to remember that above all else, messaging interactions are opt-in experiences, much like email lists. And with permission also comes a higher set of expectations. Content delivered through messaging apps and bots will need to be relevant and more personalized than a Facebook post to your whole audience, and oftentimes users will need a reason to open up a conversation or opt in. The possibilities for messaging apps and bots are endless, and Messenger opening up a bot store could be the most significant launch in the tech and marketing industries since Apple first launched the App Store. I look forward to the commentary (complete with conflicting opinions) that will come out of these developments. What do you think? Is your business ready for Instagram’s new algorithm? Everyone can calm down just a little. Instead of getting nervous about audiences finding your content, let’s focus on ways to analyze your Instagram engagement. Tracking engagement will help you execute quality content that keeps you at the top of the Instagram feed. Here I’ll outline three tools to track and evaluate how people respond to your content on Instagram. A couple weeks ago, Instagram announced that they’ll be releasing an algorithm that will prioritize what’s shown in users’ feeds. This algorithm will determine what content Instagram believes people will be most interested in and then show the most relevant posts at the top of the feed, regardless of how many accounts users follow or what time zone they’re in. If you use Facebook for content marketing, you know how important it is to make sure you’re ranked highly within a social media platform’s algorithm. Algorithms that prioritize content in a user’s feed can (and will) inevitably affect your business on those platforms. When the Instagram algorithm kicks in, maintaining high levels of engagement will help keep your content on top, whether you’re a small company or a large one. Your focus should instead be Instagram Analytics Tools. As the algorithm launch approaches, it’s important to use analytics tools to see which portion of your Instagram audience is interacting with what content, what content is performing best, and which audience segments you may be missing. As you learn from these analytics, you can create stronger and more relevant content that your audience will be more receptive to. Though Instagram shares the same ad platform as Facebook, the platform does not yet have an analytics tool like Facebook’s Insights and Audience Insights. But, we’re in luck! There are a number of third-party Instagram analytics tools available for businesses and marketers to measure their marketing efforts. The following three tools will help you to track and evaluate the success of your content & strategy around it on Instagram. Simply Measured offers a variety of reports and analyses, some of which are free and some are available only with a paid plan. Simply Measured’s free user report offers detailed analysis for a single Instagram account, including metrics on top posts, best times for engagement, and the amount and types of engagement. When you first visit the site, you can get a free user report on any Instagram account (with up to 25,000 followers) in exchange for following the company on Twitter. This user report provides an in-depth analysis of the past two months, including your top post, best days and hours for engagement, top photo tags, top filters, and the amount and types of engagement you’ve received on your posts. Knowing what days and times are best to post content can help you increase your engagement on any platform. Additional analytics tools come with pricing plans starting at $500 a month, and include features like cross-platform analysis, social brand and hashtag monitoring, and the ability to add unlimited users to the account at no additional charge. Iconosquare is my go-to tool for anything Instagram, including contests, management tools, and so on. It’s also decent for analytics. Iconosquare evaluates metrics you don’t see as often, such as spread rates and talk rates. Iconosquare’s analytics allow you to track important metrics like follower growth and losses, best times to post for maximum engagement, engagement rates, and engagement growth. It also shows your best performing content, both in terms of likes and comments. Being able to evaluate your Instagram growth history over long periods of time can help you continue to grow your presence on the platform. Iconosquare offers a 7-day free trial, during which you can access the analytics information to see if the tool is right for you and for your business’s needs. The plus plan is currently $28.80 a year and includes features like daily email reports, comment trackers, and analytics on the key Instagram metrics discussed above. Sprout Social is a popular tool that many businesses already use, and it offers detailed reporting on a profile’s Instagram activity. You can find analytics under the Reports section. You can see detailed information on daily growth in followers (and how much that number increased or decreased in the past month), the number of posts you’re sharing, your most used hashtags, your most engaged hashtags, and the number of engagements (both in total and the rate of engagement per medium). 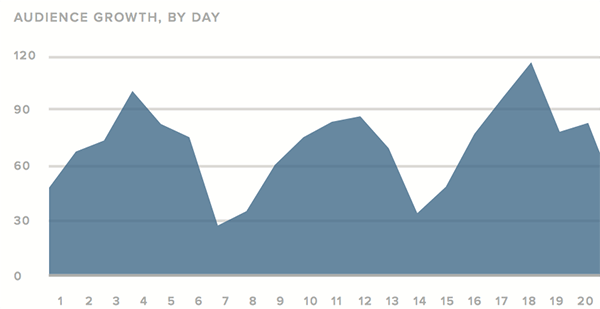 Being able to evaluate your Instagram audience growth by day makes it easier for you to spot growth trends. The only downside to Sprout Social compared to the two analytics platforms above is that it only accumulates Instagram data for the analytics once your profile is connected – no past data is provided, which is a bummer. Sprout Social provides stats not only on the total amount of engagement received, but also the rate of engagement per medium or post. Sprout Social offers a 30-day free trial, and the comprehensive reporting is available with the Deluxe plan, starting at $59 per user per month. So, just the use of a few tools can be very important to your long-term success with Instagram marketing, as they continue to tweak the service and their algorithms. This is especially true with the upcoming news feed algorithm. The three analytics tools in this article can give you great insights that you need to create higher-performing content, both immediately and in the long run. Yes, Instagram has changed its timeline algorithm, but no, it is not the end of the world for businesses. Get on the #hashtag #bandwagon – but DO NOT OVERDUE IT. If you’re a brand that does not care about your followers, or if you don’t care if your followers find value in your content, Instagram may be dead for you. But, if you are like most business owners, you do care about your customers and want to provide value to them. After all, if there is not value in your brand, your product, your service, and ultimately your content marketing strategy, why would anyone care anyway? In conclusion, fear not. Instagram is definitely not dead. In fact, this is an opportunity for you to fine-tune your content strategy when it matters most. What do you think? How do you feel about the upcoming Instagram algorithm? Do you use any of these Instagram analytics tools? Share your experience. Do you use one that I didn’t mention here? Share your thoughts, experience, and knowledge in the comments below. Social media marketing is a necessary tool for building great events, and it can also be fantastic for driving engagement during your event too. Here are a some surefire ways you can drive engagement before, during, and after your event using social media marketing. Create a content plan: Your event content plan should feature content that educates followers about the event topic, industry, speakers (etc.). Your content plan should also drive traffic to the event website, and include sales messaging. Designate that hashtag: Every event should have its own naming system and hashtag to encourage and drive organic online engagement. Email marketing: Use email marketing to keep prospects and ticket holders up to date with speaker content, agenda updates, discounts, accompanying event materials etc. Get speakers/sponsors involved! Equip everyone involved with messaging and images to share with their networks. Create content about individuals speakers and make sure to tag them and any sponsors in social media messages. Live updates via your social media networks. Use Twitter to live tweet and interact with attendees sharing with the event hashtags. Tweet quotes from speakers and share photos. You can also share photos on Instagram. On other social networks where you can’t post as frequently choose your updates more carefully. Live Feeds and Twitter walls. Digital Twitter feeds are usually a big hit. It visiaull helps an event’s design and look & feel. Attendees love seeing their own content displayed. And there are tons of tools to help you build the best feed affordably. A favorite of mine is Tint, and others I’ve used are TweetBeam, Twitterfall, and HootFeed from Hootsuite. Live stream or record parts of your event. You can live stream using Periscope or Meerkat, Facebook, and you can also share snippets of the event via Snapchat or Vine. And be sure to save videos so you can use them for post-event content. Social media kiosks. If you’re not sure how social savvy your event attendees are, teach them. You can set up a branded social media stations. Make the station fun with photo ops and giveaways complete with the event hashtag. Take time to engage with visitors letting them know the social campaigns happening around the event or sign them up for Twitter and help them send their 1st tweet. A favorite vendor of mine is Fonteco. Thank event attendees via social media channels. A personal thank you goes a long way and helps sustain authenticity. Compile shared moments and share them with your audience. You can use Storify to pull all messages using your event hashtag onto one landing page. I love Storify because it lets the people included know they are part of your Storify via Twitter – driving instant traffic. And post post event? Use all the content (quotes, pictures, etc.) that you’ve collected during the event to create even more wonderful recap content and build awareness for the next event. Building an audience from scratch and fostering meaningful conversations is intuitive and normal for individual people, but an obvious challenge for brands. From traditional marketing tactics to experiential, digital and word of mouth (including social media), marketers can’t sit idly by and just expect that their customers are engaged with their brand, or that most of them even want to engage. Yes, social media allows millions of active users globally to compete for attention, but if all of us are now publishers, who really listens? Are we all slaves to our digital platforms? Or can we go back to the basics? Define your audience, reach out to them in person and online, engage them with what they like and want, ensure authentic conversation, create experiences and share products that relate to them so they not only stick around, they bring more people along with them. As technologist and founder of Kapuno (an online community platform for niche discussions), Cyrus Radfar says in his recent post, “Social media isn’t going anywhere, but as it continues to get harder and harder to win the channels, the social proof communities can provide will help niche communities work together to spread the messages they decide are important through the more mass-market feeds.” He closes with a call to action, “Find your community and help build it, because that is where the next generation is going when they realize that social media won’t afford them a voice.”In every conversation we have with our clients, whether we’re in the “nice to meet you” phase, executing mid-program, or recapping our work, we consistently reinforce how an engaged community is crucial to a brand’s Integrated Marketing Communications success. Community and audience building goes a long way when fostering authentic brand love. It also requires marketers to think and act differently, even in the planning stages.